Hi, I'd like to show you this page I found on Zak's Home's website. 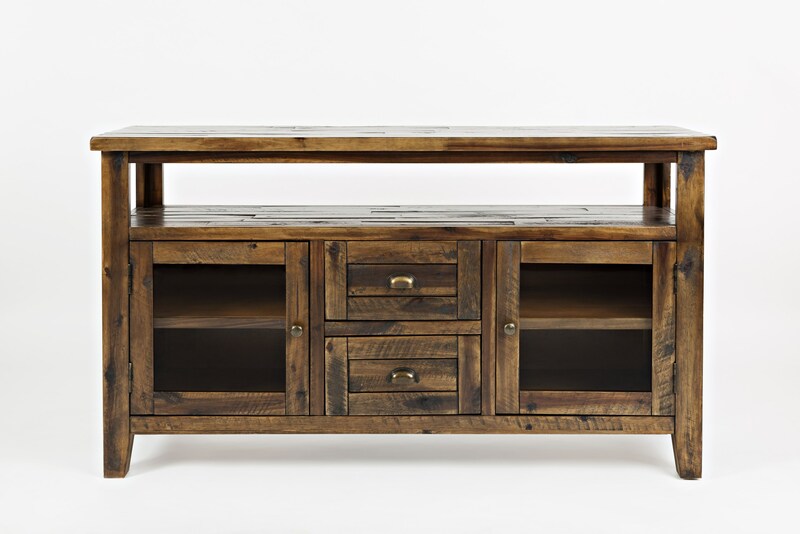 This collection has been carefully hewn to showcase the rich character of its solid hardwood construction. Each piece features entirely unique distressing and personality, bringing vibrant accent pieces to any room in the home. The Artisan's Craft 54" Storage Console by Jofran at Zak's Home in the Tri-Cities, Johnson City, Tennessee area. Product availability may vary. Contact us for the most current availability on this product. Storage Drawer Dims: 11.75"W x 11.25"D x 5.25"H. Door Opening: 15.5"W x 15.5"H. Cabinet Space without Shelf: 18"W x 13"D x 15.5"H. Int Shelf Dims (3 Position Adj): 17.5"W x 12"D.
Browse other items in the Artisan's Craft collection from Zak's Home in the Tri-Cities, Johnson City, Tennessee area. Zak's Home features a great selection of living room, bedroom, dining room, home office, entertainment, accent, furniture, and mattresses, and can help you with your home design and decorating. View recent additions to our online furniture gallery. Zak's Home offers great quality furniture, at a low price to the Tri-Cities, Tennessee, Virginia, Johnson City, Bristol, Blountville, Bluff City, Piney Flats, Elizabethton, Watauga, Unicoi, Jonesborough, Boones Creek, Midway, Flourville, Oak Grove, Summersville, Greeneville, Church Hill area.